Intelligent, multitalented and yes, beautiful women in Australia will compete for the ultimate title. Get a sneak peek into this exciting adventure, feel the heartbreak of defeat and the thrill of victory. 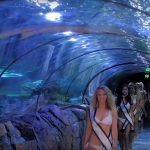 In I AM MULTIVERSE AUSTRALIA, cameras follow beautiful models from across Australia pursuing their dreams of winning ¨Miss Multiverse Australia¨. But they will soon discover the rules of this game are completely different. This is an extreme challenge, testing talent, endurance, drive, intellect and substance. They will face challenges and tests specifically designed for them to focus inwardly through critical reflection and questioning of their own behavior. This provides audiences with an inside view of the character’s journey to self-discovery. We see them navigate their emotions, form new relationships, feel the heartbreak of defeat and experience the excitement of victory. One winner will embark on her expedition to the world finals, in pursuit of the ultimate title ¨Miss Multiverse¨. We follow her voyage into a tropical island where she will compete head to head against 30 models from around the world, in the most extreme obstacle course ever designed. In this eccentric blend of competition, fact and drama, extroverted judges are seeking to find the woman who has it all, the most amazing woman on earth… she is Miss Multiverse. Please feel free to share across your websites and social channels. The post I Am Multiverse Australia – Season 1 – Teaser appeared first on PageantFame.com.